EA DICE, the developers behind Mirror's Edge and Battlefield 1942, bring us Battlefield 1943, a PlayStation Network and Xbox LIVE Arcade downloadable first person shooter set against the backdrop of World War II's Pacific front. This is the latest entry in the Battlefield franchise and the first downloadable-only console version. The shooter rolls out three Battlefield maps for ground and air action (Iwo Jima, Guadalcanal and Wake Island) and a newly unlocked airplanes-versus-carriers map Coral Sea on the XBLA Version. The map was unlocked when the 43 millionth kill was recorded — a feat the PlayStation 3 version should also achieve shortly. Stripped Down FPS: EA DICE has limited the number of classes from five in the previous game to three. Also gone is the European front of Battlefield 1942. It gives the game a pared down feel, as if it's been whittled down to a point—a very sharp point. With fewer classes to contend with, new players can best suit their play style. That means there are also fewer variables for players to deal with, making it possible to focus on things like teamwork, how to best navigate the map, title's largely unforgiving and ultimately satisfying weapon targeting. Air Strikes: In Battlefield 1943, a welcome addition is the ability to phone in pinpointed carpet bombing air strikes. It can be a game changer, and it adds another level of play, giving 1943 an extra layer of strategy. Behind the Wheel: Simply put, driving is fun. The jeeps and the Japanese sedans in Battlefield 1943 drift a bit, which makes zipping around the island a blast. Wait, M'kay? : For a game that does give players options on how they want to play it, Coral Sea pretty much does everything it can to remove those options. Two planes spawn on the deck of the aircraft carrier, and depending on how many players there are on your squad, you could spend game time just trying to get into a plane before your teammate does. (Sure, you can spend your time using an anti-aircraft cannon!) On the XBLA version, the map is selected by choosing Air Superiority in the menu, instead of Quick Match. The separation might be viewed as a hassle for some, but a blessing for others. For those looking for a multiplayer FPS, Battlefield 1943 delivers and then some. The vehicles and dogfights mix gameplay up and keep things fresh. Perhaps the biggest compliment I can pay the game is that Battlefield 1943 made me want to get better — get better to improve my own score and skill, but also get better to help my team. Those used to typical console shooters with forgiving auto-aiming might need to re-calibrate for 1943. Those that do will find the effort well worth the trouble. 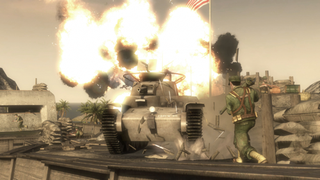 Battlefield 1943 was developed by EA DICE and published by EA for the PlayStation Network and Xbox LIVE Arcade. Retails for US$14.99 and 1200 MS Points. Played for upwards of 15 hours.